Why did Pope Francis criticize the 1968 movement in his speech to diplomats? 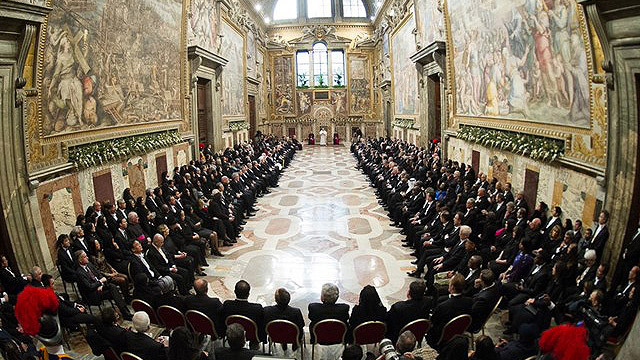 Pope Francis addressed his first speech of the year to the Diplomatic Corps accredited to the Holy See, following a consolidated tradition. The Pope’s speech was particularly important. It did not merely consisted of a wide and detailed overview of the Holy See’s diplomatic work. The speech identified also some critical points. In particular, it identified a very precise critical moment: 1968. It is not the first time that the 1968 revolution, and the change of vocabulary it bore, is part of the Holy See’s diplomatic message. Archbishop Silvano Maria Tomasi, when he was Permanent Observer of the Holy See to the UN Office in Geneva, underscored many times the connection between the affirmation of the new rights started with the 1968 sexual revolution, and a change in the diplomatic scope of work. It is however the first time that Pope Francis, in a diplomatic speech, clearly shed light on the issue, going beyond the general sense of diplomatic discussions. In the end, the Holy See diplomacy must not just be part of the processes. Rather, it must make of those processes a path toward the common good, the real Holy See’s international agenda. On the other hand, “that the traditions of individual peoples” are “invoked as a pretext for disregarding the due respect for the fundamental rights proclaimed by the Universal Declaration of Human Rights” – an approach that the Holy Father rejects. This is a crucial issue, directly connected to the international situation. The new vocabulary that was born out of the 1968 sexual revolution has taken coherent and definitive shape since 1989, when the fall of the Berlin Wall generated the so-called multipolar world: there are no longer opposing blocks, with a plurality of subjects coming into play. The United Nations was not called anymore to face the emergency of a possible war, but felt it had been given a sort of universal vocation. The new vocabulary of the United Nations is born out of that universal vocation. The new keywords are human globalization, sustainable development, good governance, world ethic, cultural diversity, dialogue among civilization, quality of life, gender, equal opportunities, homophobia, sexual orientation, safe abortion, future generations rights, non-governmental organization, partnerships, civil society, participative democracy, transnational networks, consensus building, inclusive approach, agent-actor of social transformation, best practices, sexual and reproductive rights, right to choose, equal commerce, diverse forms of family. Behind each of these words lies a particular threat. For example, behind the formula “reproductive health right” lays hidden the intent to affirm the right to abortion. Not by chance, Pope Francis himself, in the speech delivered to diplomats, underscored that the right to health “has assumed implications beyond the original intentions of the Universal Declaration of Human Rights,” which “sought to affirm the right of every individual to receive medical care and necessary social services”. These words were, in fact, an indirect criticism of the promotion of Sexual and Reproductive Health Rights. In the end, Pope Francis speech to diplomats can be considered a powerful complaint against the lobbies that are working to affirm a series of new rights that not only deviate from the original spirit of the Universal Declaration of Human Rights, but also instrumentalize that spirit to advance these new rights. This new anthropology – he continued – creates a person “closed onto itself”, that “reaches his goal” when his / her wishes are met. The relational dimensions is thus denied, and the outcome is “emptiness and nihilism,” that also brings about an overturning of nature, so that “gender and physical identity” are not endowed by nature, but chosen by the individual. One of the strategies to carry forward this new anthropology is to corrode society starting from the family, as it happened at UN conference of Cairo 1994 and Beijing 1995. Not by chance, Pope Francis identified the family as one of the pillars of pontifical diplomacy, as a reaction to the deconstruction of family carried forward at the highest diplomatic levels. As sexual gender becomes a choice, family, maternity and children are just an obstacle to the right to a limitless freedom and to self determination, and for this reason the notions of family, maternity and children must be transformed. Thus, social, political, juridical and spiritual norms are to be changed and redone according to the sociocultural changes of the moment, or individual choices, or the agreement of a majority. All of these opportunities are an outcome of the new dictionary of the United Nations. It is, in the end, the dictatorship of relativism that Benedict XVI already denounced – he dedicated to truth his first message for the World Day of Peace (In Truth, Peace). Pope Francis’ diplomatic approach is more pragmatic. It was widely noted that a lot of the UN vocabulary found its way into the encyclical Laudato Si. The adoption of that vocabulary can be a problem. But the very pontifical diplomacy adjusted things. The notion of “integral human development” was the center of Pope Francis’ speech to the United Nations in New York on Sep. 25, 2015. A new Vatican dicastery has been specifically dedicated to integral human development, incorporating the term in its very title. With his latest speech, Pope Francis incorporated his diplomacy of mercy and prayer to the subtle diplomatic battles. Opposing the UN vocabulary is one of the Holy See’s objectives, especially in international negotiations, where every detail is important. This small addition in a negotiation on arms and disarmament – which is one of the main focus of the Holy See diplomatic action – could be used to pressure countries to be “gender sensitive” and to develop legislation for a new kind of “health care system”. The reason for the crisis of the human being, in the end, really lies in this change of vocabulary started with the 1968 sexual revolution. The outcome of that sexual revolution was that of creating a man that stands alone, detached from social relations, who is allowed some hedonistic pleasures but no possibility to really take decisions. So, speaking of the 1968 crisis, Pope Francis reiterated the Church’s concern for the human being. 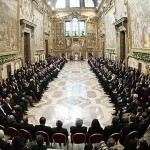 And he underscored that the center of the Holy See’s international commitment is the common good.